Learn to create an elegant and fashionable fall-inspired design. Mia Secret international exclusive educator, Arturo Osorio, demonstrates how to create an elegant and fashionable fall-inspired design using the professional brand’s colored acrylic powders. 1. Prep nails for acrylic application. Properly place a sculpting form and extend the nail plate, using cover pink acrylic powder. 2. Sculpt the smile line, using gold acrylic powder. 3. Sculpt a second smile line to extend the length, using black acrylic power. 4. Encapsulate the entire nail with clear acrylic powder. 5. 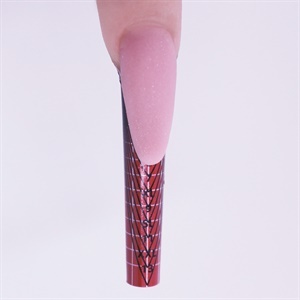 Contour the cured nail, using the 100-grit Speedy Zebra file and use a finer grit file near the cuticle area. Buff to shine and remove debris. 6. Apply a thin layer of UV Finish Gel and cure for 60 seconds. 7. Paint an outline between both smile lines, using white Formagel and a nail art brush. 8. Paint decorative swirls over the black free edge, using white Formagel and a nail art brush. Cure for 30 seconds. 9. Add more nail art details over the pink area and cure. 10. Embellish the look as desired.